​For my piece the "Directional", also inspired my Piet Mondrian, I intended to create a Blockprint piece that through the use of similar methods and design elements as Piet Mondrian while including the influence of the enviorment around me. The process involved carving onto the linoleum material, then applying ink, to which will be applied to printing paper. Lastly, water color based paints were then used to implement my inspiration from the work of Mondrian. During the process of creation of the piece "Composition II", Mondrian went to high point in France and sketched what he'd seen below him and then created his "Composition" piece through the addition of colors. It was based of the streets and building structures that he was looking down on. With this in mind I decided to implent this within a blockprint piece. The linoleum itself was very maleable and acted as a very good medium that could be carver into, although, I planned on adding colors to the piece in order to represent my source of inspiration. After consultation with peers and instructors, I was advised that using water colors would be the best descicion in this application because acrylics would cause the paper to shrivel, due to the absorbant charecteristics of acrylics. Becuase the ink that would be used is water based, and would not repel water colors, it became a clear chose that water colors were the most suitable option. The central concept that was inspiration from mondrian was the geometrical shapes used within his piece, to which I also wanted implent alongside the similar use of color composition. The process first began by choosing an area of Milwaukee that could properly represent source of Inspiration, composition by Mondrian. The area needed to include buildings and streets next to each other and streets with little space in between them. After choosing what I felt was the correct area of downtown Milwaukee, I then printed the selected area so that I could shade the back of the paper with pencil, which then I would imprint the lines and structures onto the linoleum, for the sake of craftsmanship. After the pencil lines were implied, I used a ruler for corrections to lines that were not perfectly straight. The carving process came next, and in this case it proved to be the most difficult part of the process because the lines and structures being so close together proved to be very challenging when attempting to carve narrow and accurate lines resembling a city, an avoidable obstacle came in the form of the tool used to carve onto the linoleum, this tool was essentially designed so that the carving could result in more open and less geometrical shapes, while geometrical shapes was much more fitting to what the linoleum needed to look like. Another issue was some of the imperfections of the carving that were apparent later, to which I attempted to address with other carves, which worked in most areas. The areas to which this didn’t work came apparent in the inking process. The first step of the inking process involved spreading ink onto a metal pan with an ink roller then rolling the ink onto the linoleum. 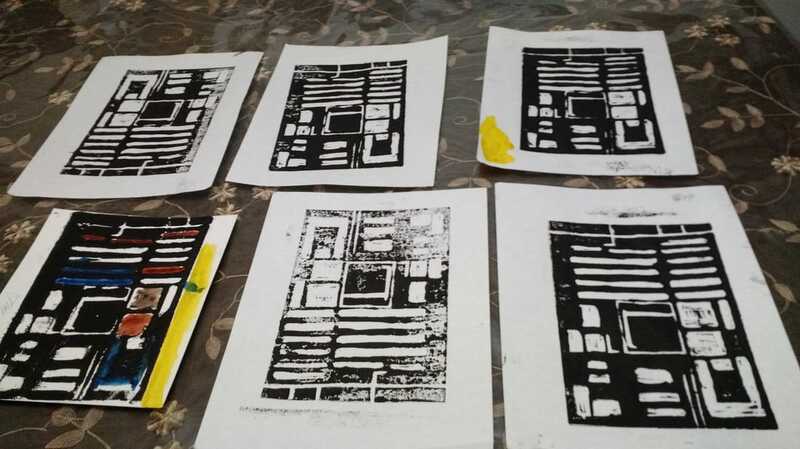 After which, the linoleum was placed between two papers and the one the needed to have ink printed onto was where pressure was applied with a hand tool that works especially well with smooth flat surfaces. Then after multiple prints, I had finally produced that was clean enough for presentation. After this point, I then used water colors to represent the second aspect of my source of inspiration. The main difficulty with applying the water colors was due to some areas not being completely dry and ink colliding with the water colors, then came the drying stage. Before doing the imprints, I had experimented with different types of paper in hopes of finding the best fit for the print, and I found that if water colors were going to be added the best route was to use dry point purposed printing paper. In conclusion I am satisfied withe end result although I do see areas for improvement, one being how I could have used a different tool during the carving process for more narrow and accurate lines. Secondly, allowing for time for the ink to dry before applying water colors. Despite this, when comparing against my source of inspiration, I maintain that the connection is visible and has been properly represented. 1. Clearly Explain how you are able to identify the cause effect relationships between your inspiration and its effect upon your artwork. The clear relationship between my inspiration and the piece that I created is clear within the structure, being the color composition and structure. An Areas that may interfere with identification of the inspirations relationship with the final piece, would be how my piece overall has considerably more dense concentrations of a single color. 2. What is the overall approach (point of view) the author(from your research) has regarding the topic of your inspiration? The author of my research being other Art experts would believe that I created a piece that embodied Mondrian’s elements rather than replicated. ​3. What kind of generalizations and conclusions have you discovered about people, ideas, culture, etc, while you were researched your inspiration? A idea that I was reminded of during research was that looks can be deceiving because my source of inspiration created a piece that seems to be completely based off self input rather than involvement of environmental elements. 4. What was the central idea or theme around your inspirational research? The central theme or idea around my research would have to be the importance of process because in the research of my piece, I saw how process of a piece coincides with each other step heavily, something I was reminded of in the creation of my piece. 5. What kind of inferences (conclusions reached on the basis of evidence and reasoning) did you make while reading your research? ​An assumption that I had made while in the early steps of my research was that the piece that I had taken inspiration was based off self input rather than involvement of environmental elements, which I discovered wasn’t true after completing the research.